After months of speculation, rumors, fakes, and wondering how the heck Nintendo has gotten this far into 2016 without even revealing a name for the console it plans to launch next March, the company has finally unveiled its next gaming system: the Nintendo Switch. As expected, Switch is a hybrid between the two kinds of consoles Nintendo has been making for decades. It comes in two parts, a docking station that plugs into your TV and a tablet you use to play games on the go. At home, the tablet slides into the dock and your game displays on the TV. When it’s time to go portable, you split the console’s controller, which Nintendo is calling a “Joy-Con,” in half and slide each piece onto the sides of the tablet screen, making it resemble a more traditional portable system. If you’d rather use the screen’s built-in stand to prop the tablet on a table and use it more like a TV, you can slide the controller halves off and put them together for a full pad or hand out the other half to a friend for some multiplayer action. According to a press release from Nintendo, the system will also be compatible with a new Pro Controller, giving yet another option for how to play. 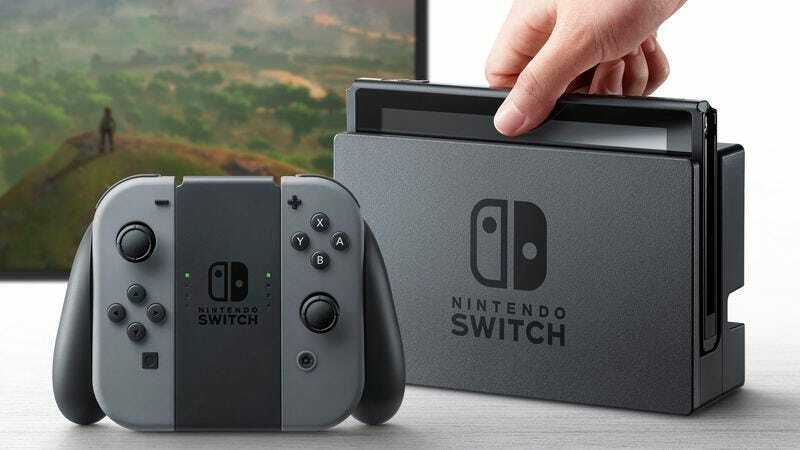 Nintendo is still saying the Switch will be released in March, but did not reveal a specific launch date, price, or even games that will launch alongside the system. A handful of games were seen in the announcement video, including the upcoming Legend Of Zelda: Breath Of The Wild. Some of them resembled Wii U games, like Splatoon and Mario Kart 8, but no plans for backward compatibility have been announced, so it’s possible these are new games or enhanced rereleases. The video also includes a glimpse at what appears to be a new Mario game, and a Switch version of The Elder Scrolls V: Skyrim, which was recently rereleased for PlayStation 4 and Xbox One—Bethesda, the publisher of Skyrim and Fallout, was among the long list of companies Nintendo says is working on Switch projects. Nintendo promises to reveal more details about Switch and its games as we get closer to its March launch date.